Kamakura shirts review 2018 - detailed informtion on sizes and quality. Looking for a Kamakura shirts review or a Kamakura shirt fit guide? Below is a detailed review of Kamakura shirts and all the cuts and sizes available, including detailed actual garment measurements. We also discuss Kamakura quality. Kamakura sells five different cuts of shirts. Tokyo Slim Fit has a slimmer profile, with two back darts. Tokyo Slim Fit – Manhattan – slimmer than the Tokyo Slim Fit in the waist, but the same in the chest. Tokyo Classic Fit has a more generous fit. New York Slim Fit has a profile similar to the Tokyo Slim Fit, but is slightly larger through the shoulder, body and sleeve. New York Classic Fit has a profile similar to the Tokyo Classic Fit, but is slightly larger through the shoulder, body and sleeve. Kamakura cuts all its shirt patterns in centimeters, not inches. It warns on its site that the inches measurements are a rough indication. I think there are inconsistencies in their tables as the inches figure are not always the centimeter figure divided by 2.54. Therefore the figures below are based on my calculations, taking the original centimeter figures and dividing those by 2.54 to obtain an inches figure. This gives a more precise figure, but means that the Kamakura collar sizes do not fit neatly into full and half inch collar sizes. 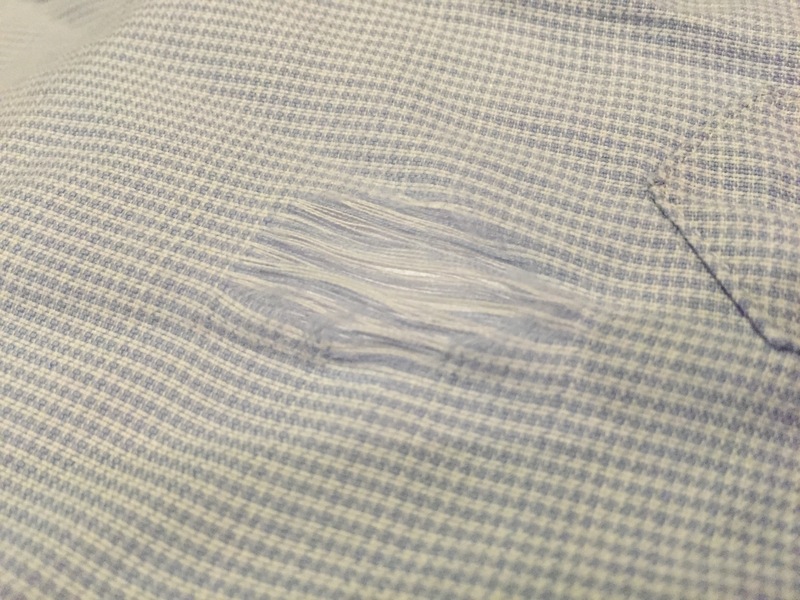 As part of the Kamakura shirts review I bought one of their shirts to assess the quality. I’m not impressed by the quality. I wore their their shirt in rotation with other cheaper brands like Hawes and Curtis and Charles Tyrwhitt. While the others were fine, the Kamakura soon had a hole in the sleeve at my elbow. Since it’s only one shirt, so one should be wary of drawing too strong conclusions. But I wouldn’t buy Kamakura if you’re looking for a shirt that will last if you wear it regularly.